Go for it! They are always so pretty! Sounds awesome! You should go for it. Maybe it’s a start towards repeating colorways? Hmm.. We’ll see! 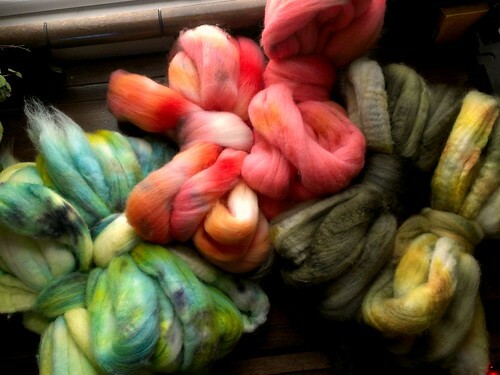 I have been trying to keep track of colors, but I still dye the way I usually do. I LOVE this idea. I would gladly buy companion colors. I think it would make some crazy cute yarn. If I could, I would buy these right now. Seriously! Thank you so much! I’ll let you know if these don’t get picked up this weekend. Jenna, I have two of the three still in stock! I sold the pinkish one, so the two greenish ones are left (both are Blue faced Leicester). I think that is a great idea. Don’t stop yet.